The ire that black farmers and their advocates are currently feeling has two targets: the Senate's failure to vote the money to complete the farmers' settlement with the U.S. Department of Agriculture, and President Obama's recent generous offer to white Arkansas farmers. Both examples of political expediency are bitter reminders of black farmers' second-class status. For five months, the Senate has blocked passage of legislation that contains money to fund the USDA's $1.25 billion settlement of the second bias suit lodged by black farmers. 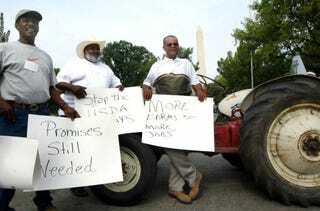 The agreement, called Pigford II, is supposed to redress past USDA racial discrimination cases. In 1997 Pigford I, the first USDA settlement, provided 13,000 farmers with $50,000 each and debt relief. Timothy Pigford, a North Carolina farmer, and 400 other African Americans had filed a class-action suit against the USDA, alleging bias in allocation of farm loans and assistance. For decades their complaints were ignored or got a slow response. Pigford II occurred after the USDA admitted that thousands of other black farmers' claims from the 1990s went uninvestigated. John Boyd, founder and president of the National Black Farmers Association, says that bills to fund the settlement have failed seven times in the Senate, and a black-farmer attachment was taken out of the recent farm-aid disaster bill. "We have been working on our restitution for 26 years," Boyd says. In August alone, Senate Republicans blocked the settlement twice. Gary R. Grant, president of the Black Farmers and Agriculturalists Association, asks, "Don't these legislators in states suffering economically know the money will boost the income in their state?" Money is the fuel of politics. But with the November polls looming, senators who vote to give anyone more than $1 billion, even if it was agreed on long ago, worry that voting to pay the black farmers could cost them re-election. He recently traveled there four weeks in a row, meeting with senators from both sides of the aisle. But, Burkett says, the Democrats won't vote for the funding because they are terrified in an election year. The Republicans say that they won't vote for the funding as an attachment because they think it will encourage Democrats to attach similar requests. Regardless of either side's actual motives, they won't openly vote yes. Undeterred, Burkett will visit the Senate again. The $1.25 billion is a raindrop in an ocean of federal money, and since it must be paid, there is no need for an offsetting cut. "Both sides just don't want to vote," he says. Are White Farmers' Votes More Important Than Black Farmers' Livelihoods? This summer the Obama White House promised Arkansas Democratic Sen. Blanche L. Lincoln that farmers in her state would receive $1.5 billion, ostensibly for disaster-relief aid. Cynics, however, say the money is a payoff to the farmers along with their relatives, friends and other Arkansans to get them to vote for Lincoln in November. An Associated Press article reported that major newspaper editorials have castigated the deal, saying that the plan will bypass congressional approval and benefit wealthy farmers. A Washington Post editorial, mentioned in the AP article, declared, "If you think this looks like a back-door plan to almost double almost everyone's subsidy, we agree with you." The Congressional Black Caucus has addressed the issue of the Arkansas farmers' potential payments. In July, the CBC wrote to President Obama requesting that he and the Congressional leadership identify how to fund settlements for black farmers. The letter stated that, "The current hardships experienced by other farmers should not trump hardships placed on African Africans" by the Department of Agriculture in the past. Jerry Pennick, director of the Federation of Southern Cooperatives/Land Assistance Fund, says that the White House has been working behind the scenes to assist the passage of the funding in the Senate, and the president supports the legislation. This past Thursday, Ben Becker — press secretary for the Senate Agriculture, Nutrition and Forestry Committee, of which Lincoln is chair — said that Lincoln and the administration were still working out the details regarding the disposition of the $1.5 billion. According to the NBFA, its members operate much smaller properties than white farmers do and are treated differently. The organization's average member farms 50 acres, while the average white Midwestern farmer has 1,000 acres. When agricultural subsidies are provided to the black farmer, he gets an average of $200; large white-owned farms receive $1 million. The mix of these factors has created a serious detour in at least one farm family's future. Boyd farms acreage in three Southern counties, raising 100 head of beef, soybeans and wheat. His son, however, has no interest in becoming a fifth-generation farmer, the father says, "Because he watched me scuffle. He is studying computers." Dampened optimism also prevails regarding what the Senate may do in terms of funding the settlement. Representatives and off-year senators will soon head home to campaign. Pennick of the Federation of Southern Cooperatives hopes that there will be a positive change after the election. That can't come soon enough for Boyd. To him the situation is depressing, particularly when it comes to older farmers. "I am going to funerals left and right, and [at this rate] it won't be very long before there won't be any black farmers," he says. Frank McCoy is a regular contributor to The Root. He covers business and technology. Become a fan of The Root on Facebook. Follow us on Twitter.